During the last decades of the 19th century, as the railroad established itself as the dominant form of overland transportation in Connecticut, events were in motion that would undermine its future and alter the direction of transportation for generations to come. 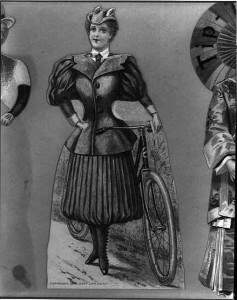 The agent of change was a modest new technology in whose popular success Connecticut played an important role: the bicycle. In 1878, Colonel Albert Pope, a former Civil War officer and successful entrepreneur from Boston, began the manufacture of what was called the high mount or “ordinary” bicycle at the Weed Sewing Machine Company in Hartford. Pope had first seen the ordinary bicycle, an English import, at the Centennial Exposition in Philadelphia two years earlier. Despite the difficulties of riding a cycling machine with a front wheel 54 inches in diameter and rear wheel less than half that size, Pope was determined to make the ordinary bicycle an American success story. To that end, he acquired the patents needed to legally control the trade in this country and within a few years was producing 10,000 bicycles a year from the Capitol Avenue plant in Hartford, which he now owned. As the popularity of cycling grew, bicycle clubs appeared in cities across the country, including Bridgeport, Hartford, and New Haven. 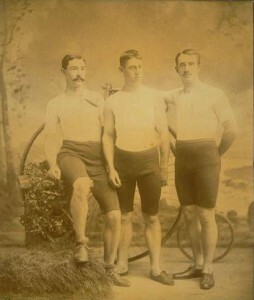 In 1880 Pope, a businessman who knew the value of product advertising, convened a meeting of 31 cycling clubs in Newport, Rhode Island, and formed the League of American Wheelmen, a national organization with state chapters that acted to promote bicycle touring among those daring enough to undertake the challenge of an ordinary bicycle. 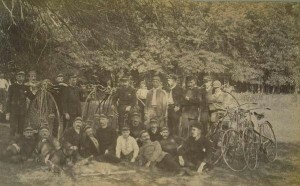 As a result, a social network of cyclists evolved in many states, including Connecticut, where the league produced its first Connecticut roads book in 1886. By 1890, the pocket-sized Cyclist’s Road-Book of Connecticut had been revised to include more than a dozen suggested cycling tours and fold-out highway maps, with recommended routes highlighted in red, for each of Connecticut’s eight counties. Each route segment was rated in increments, from poor to first class, for the condition of the roadway as well as its grade, from level to very hilly. In addition, the league held annual tournaments in Hartford and New Haven, where ordinary cyclists gathered to race, share adventures, and celebrate their sport. For the cycling league, it was an opportunity to recruit new members. Together with a road book of recommended touring routes, membership included discounts at certain hotels and restaurants along the way. An odd thing about the town, and one that rather offset its sentiment of antiquity, was the omnipresence of bicycles. Everybody, old and young, male and female, rode this thoroughly modern contrivance. Pedestrianism had apparently gone out of fashion, and I got the idea that the children learned to ride a wheel before they began to walk. 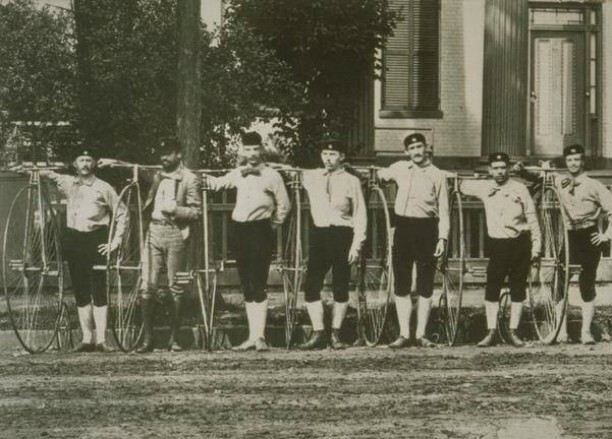 As the cycling craze grew, the role of the League of American Wheelmen expanded to include a national campaign for the construction of good roads, especially of inter-city country roads, which were often poorly maintained by the compulsory labor of town residents. As a member of the league’s national executive committee, Albert Pope became a relentless advocate for good roads, using his own funds to establish the league’s Good Roads magazine and to endow courses in highway engineering at the Massachusetts Institute of Technology. To broaden the scope of the issue beyond cycling, Pope gave numerous speeches on the economic benefits of good roads to groups such as the National Carriage Makers Association and the Hartford Board of Trade, and in 1892, he founded another lobbying organization, the National League for Good Roads. Pope’s advocacy proved effective on both the national and state levels. Following a petition to establish an ongoing national program for road improvement, Congress established the Office of Road Inquiry in the US Department of Agriculture in 1893. The office disseminated information on good road engineering and built short segments of “object-lesson” roads in select cities to whet local appetites for additional good road construction. While the Office of Road Inquiry did not plan or fund a national network of good roads (that would have to wait for its successor, the Bureau of Public Roads, and the Federal Aid Highway Act of 1916), it became a permanent presence in the national government and replaced the League of American Wheelmen as the chief lobbyist for good roads. The good roads movement initiated by Pope and the League of American Wheelmen impacted state governments as well, as the heavily traveled Northeast established the first highway departments in the nation. The Connecticut program, established in 1895, evolved into a cooperative venture between individual towns and the state government, with towns funding from one-quarter to one-third the construction cost of road improvements, while the state provided the remainder. By the late 1890s, the state budget for good roads was $250,000 annually, enough to improve perhaps 80 miles of road each year. It was a slow start, but funding gradually increased. By 1905 the Connecticut Highway Department had identified a statewide system of trunk line highways (a scheme to handle long-distance through traffic) that totaled about 1,000 miles and whose improvement and ongoing maintenance was the state’s sole responsibility. State (and eventually federal) funding of highway improvements represented a radical departure from past transportation policy, in which all manner of improvements—from turnpikes and steamboats to canals, railroads, and street railways—had been provided by privately owned corporations. The change in policy had been prompted by the latest in a long line of transportation technologies, the bicycle, and by men like Albert Pope. Herlihy, David. Bicycle: The History. New Haven, CT: Yale University Press, 2004. Pope, Albert. “The Bicycle Industry.” In 1795-1895. One Hundred Years of American Commerce ... a History of American Commerce by One Hundred Americans, with a Chronological Table of the Important Events of American Commerce and Invention, Vol. 2. New York: D.O. Haynes & Company, 1895. Link.